Microphone stands are a very under rated piece of hardware in your sound equipment inventory. There are a few different types of microphone stands and usages for them. In worship settings, to help out the musicians and to give the best performance out of the microphones used, its best to have the right stands all the time. The three most common stands are the telescopic (vertical) mic stands, boom mic stands and turtleneck microphone stands. These stands are pretty limited to what they can do, based on the fact that they only go up and down. These stands should not be used for singers with instruments, like guitars. This is because for a singer to amplify his or her voice through the microphone, they must be placed as close as they can. However, this will not work that well for guitarist, bassests or other instrumentalists because their instrument will be in the way and hitting the stand. Telescopic stands can do well for mic’ing guitar amplifiers, certain types of choirs and some drum applications. Boom style microphone stands are the most needed most versatile microphone stand. These microphone stands are great for vocalist and singers with instruments. Because they ‘boom’ out, they are able to go higher and on different angles. For mic’ing the drums, piano and electric guitar amps; the boom microphone stand is the best way to go. They extend out or in, depending on the need of the microphone placement. 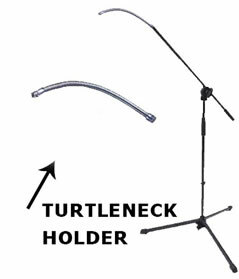 Turtleneck mic stands are mainly seen for mic’ing drummer vocals. For the odd drummer that sings and plays, they will require a flexible stand that can go exactly where they want. Turtleneck stands are extensions that can be screwed into boom stands. They are very flexible, yet sturdy pieces that stay where they are placed. The placement of exactly where the turtleneck stand should go, depends on where it best suits the drummer. Normally the base of the stand is placed beside-behind the drummer. Then the use of the flexible turtleneck piece is moved to the desired spot. These microphone stands are also used on pulpits because they are very versatile. If you have different people coming up and talking behind the pulpit these stands are a popular choice because of how fast you can adjust these microphone stands. Most churches will have telescopic microphone stands and boom mic stands. It will bring great ease to the musicians and to the quality of the audio captured by the microphones, if the proper stands are used. Check to make sure that each musician is comfortable with the style of stand you give them.